"Skip the hype - digital business is about change, plain and simple" Sitting down this week with CEO Rob McGillen, founder of Practically Digital, we ask his insights that business leaders should understand on digital business and transformation. "Digital means something different to every person, and every company" observes Rob McGillen. "Many times, tech companies and consulting firms are sharing digital visions about the future 3 years from now - without any clarity on what you can do now to get to that future. We see it differently. Working across industries, we sense clear business trends and digital investments that make a major difference. That is what we focus on with our clients - finding better choices and helping them on the digital journey now." "Many companies are daunted by digital 'moonshots' which take years and millions to achieve. These big bets are risky and impact growth. " shares Rob. 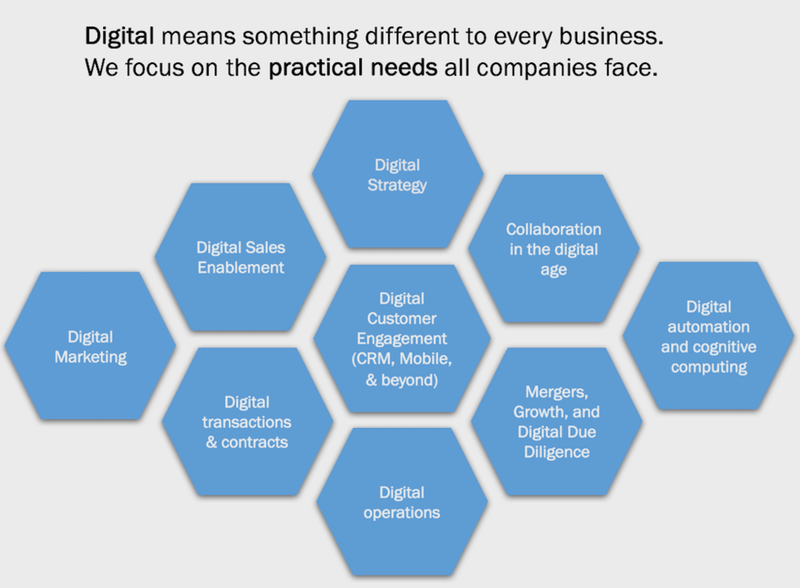 "Our focus at Practically Digital is to help digitize the common business practices all companies face. This approach helps build confidence, delivers incremental value quickly, develops change skills on digital business, and establish a 'digital first' eco-system for the business. When everyone is thinking and working digital - it is much easier to go for the moon, and much less cost and time." 1) Stay hyper focused on the digital / real world customer. The customer experience remains key, and needs to be continuously aligned with. Journey mapping the customer experience (B2B or B2C) across your real world and digital touch points with your brand and service / solutions makes a major difference as you adopt digital solutions. Bring those touch points and insights back to a cloud based CRM / relationship system. 2) Digital Sales Enablement is the secret weapon to digital growth. Digital marketing and social media are 'table stakes' activities - you need to do it, your brand absolutely needs the visibility, and- it has become a commodity. Digital Sales Enablement - integration of 'facilitated sales platforms' and CRM solutions is becoming the major capability that companies can leverage to increase sales and growth. 3) Artificial Intelligence has reached a maturity stage, where smaller players who are specializing and partnering. You will see A.I. embedded in over 1/3 of your products and platforms in the the course of the next 24 months. It is now found in part on chips in the newest iPhones, and more importantly - the cloud-enabled platforms are embedding and making possible for customer service, sales support and analytics, relationship builds with customers, and even tailored customer intake processes. 4) Robotic process automation (RPA) is ready for the prime time. As more companies are struggling with outsourcing (either visas, quality, or contract renewals) - the alternative that is now commercially viable is RPA. Over 20 solution providers now exist in this space, and you will see the major consulting companies and outsourcing / system integrators will be offering this as a strong / lower cost alternative to the traditional BPO / ITO solution. Get ahead on this curve and decide which makes sense for your company. 5) Digital collaboration platforms (with video and content targeting and sharing) that work on mobile are becoming a major supercharger for corporate speed and decision making, and engaging field / remote team members with a core corporate center. We are finding companies who leverage these new generation are finally making a difference in the area of collaboration. A final insight from Rob McGillen. "These 5 digital activities are not hard efforts to rapidly prototype and bring online if a company is ready to make the journey. The right thing to do is tackle one or more of these initiates together that enhance the collective value to the company. If you want to engage the customer better - focus on Sales, Marketing, transactions. If you want to improve efficiency and growth within - collaboration and video engagement are great choices. It depends on your business goals now and next. The key point is 'don't wait' for the digital moonshot opportunity. Be practical and get moving! " To learn how Practically Digital can help your company on digital transformation and capabilities you might consider, get in touch!